Curved mirrors focus the sun’s rays at the Amal field. Photo credit: GlassPoint. In the vast empty spaces of Oman’s desert, about 300 km north-west of the southern city of Salalah, lies the Amal field. In common with many other fields in the country, Amal has considerable reserves of heavy oil – liquid petroleum with an API gravity of less than 20°. Heavy oil is highly viscous and does not flow easily, so the usual techniques for extracting the oil from reservoirs are not effective, and steam-assisted gravity drainage is used to induce it to flow to the surface. In this technique a pair of horizontal wells are drilled into the reservoir, one a few meters above the other, and high pressure steam is continuously injected into the upper wellbore to heat the oil and reduce its viscosity, causing the heated oil to drain into the lower wellbore, where it is produced. This is highly effective, but uses vast amounts of steam, which in Oman has been generated by burning natural gas, and now accounts for about 20% of the country’s total gas use. With gas reserves depleting in the country and demand for domestic consumption increasing, however, using gas for enhanced oil recovery (EOR) is becoming unsustainable. It is also expensive: it is estimated that in a typical heavy oilfield, between 60% and 80% of the operating cost is fuel purchase for steam generation. One commodity which is not in short supply in Oman is sunshine, so for a number of years Petroleum Development Oman (PDO) have been looking into ways of harnessing solar power to help produce heavy oil. In 2011 the company began collaborating with solar energy supplier GlassPoint, and in 2013 Alam West, the first solar EOR project in the Middle East, was commissioned. The 7 MWt pilot project delivered 50 tonnes of solar-generated steam a day, proving the effectiveness and cost-efficiency of the technology. How Is The Steam Produced From Solar Energy? 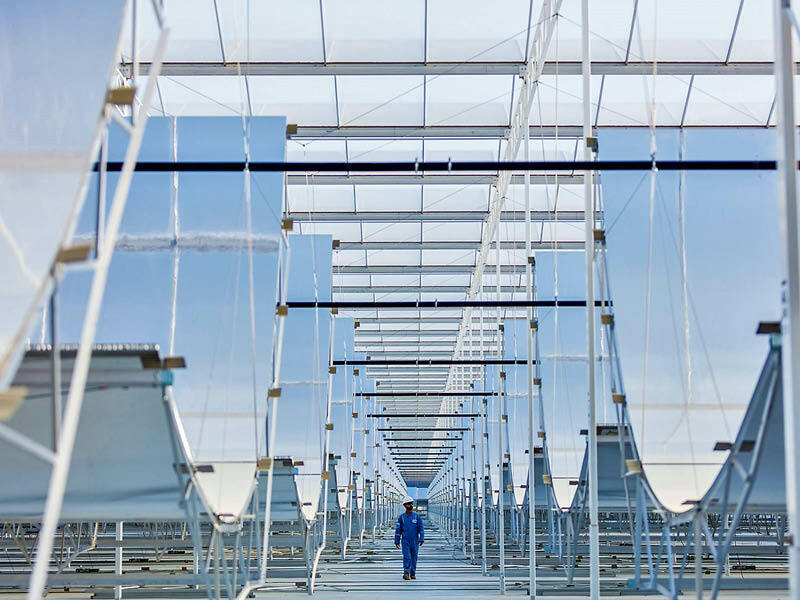 Huge greenhouses protect the steam-generating mirrors in the Miraah project. Photo credit: GlassPoint. This paved the way for the development of a full scale solar-powered enhanced oil recovery (EOR) plant on the Amal field, with construction beginning in 2015. Unlike the solar panels that are used to generate electricity, GlassPoint’s solution uses large mirrors which are curved, so they focus sunlight directly onto a pipe filled with water, which boils and is converted into steam. The mirrors are very simple curved sheets of aluminum foil, suspended by wires from the ceiling, and as the sun moves across the sky, small motors pull the wires to adjust the angle of the mirrors. The steam generated is exactly the same quality, temperature and pressure as that produced by burning natural gas, and can be fed directly into the oilfield’s existing steam distribution network. 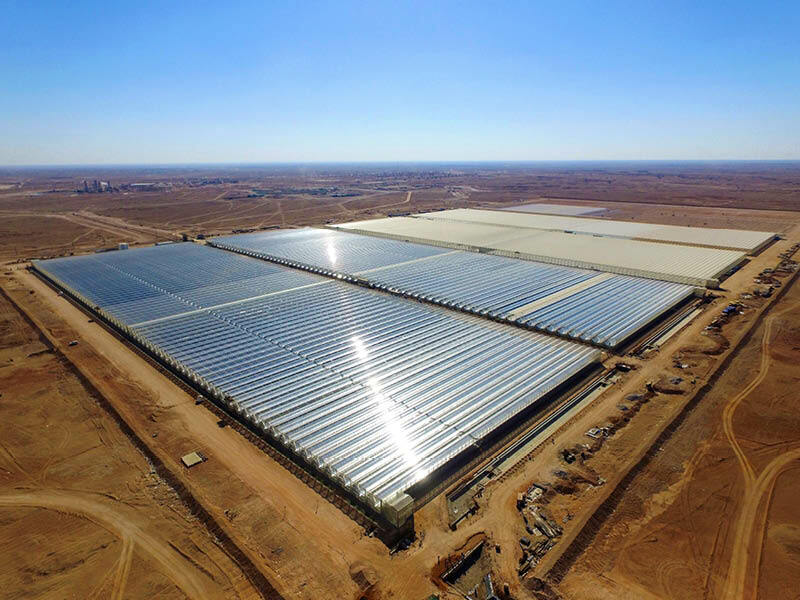 The arrays of mirrors are protected from the harsh desert winds and dust storms by greenhouses, which means that the components of the mirrors themselves can be lightweight and inexpensive. In February 2018 the first four greenhouse blocks of the project were inaugurated; these can deliver 660 tonnes of steam per day, with a total capacity of over 100 MWt, and the project is on track to deliver an additional eight blocks by early 2019. Once completed the project, which is called Miraah (Arabic for mirror), will consist of 36 blocks, will cover 3 km2 (an area equivalent to more than 360 football pitches) and will generate an average of 6,000 tons of solar steam each day, with a total capacity of one gigawatt. In fact, Miraah will be one of the world’s biggest solar plants and will deliver the largest peak energy output – 1,021 MW – of any solar plant in the world at present. Aerial view of the huge greenhouses protect the steam-generating mirrors in the Miraah project. Photo credit: GlassPoint. 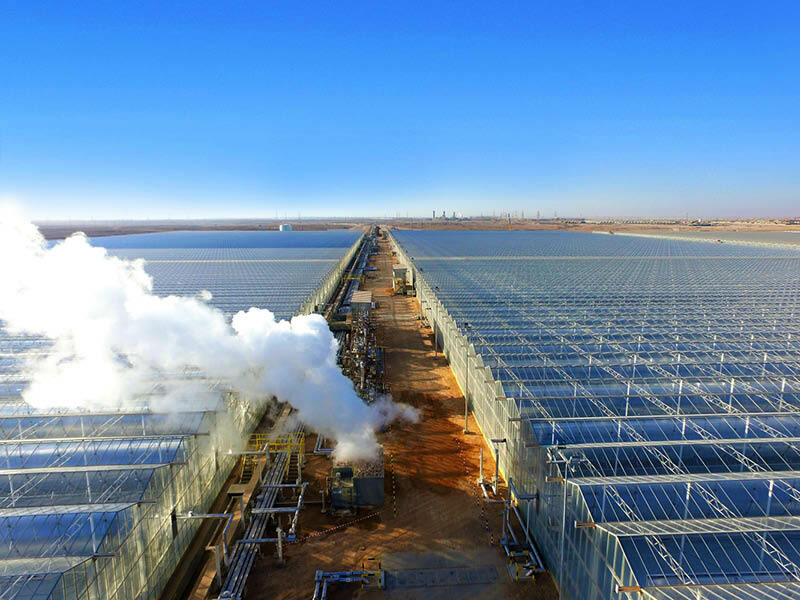 For PDO, using solar power to create steam will significantly reduce operating costs for the Amal field, where it is estimated that the Miraah project will produce enough steam to extract about 35,000 bpd of heavy oil. The use of solar for EOR has therefore become a long-term strategic solution for PDO to develop its heavy oil portfolio and reduce consumption of natural gas. There are also major economic benefits to be gained by Oman through the use of solar energy for EOR. It is estimated that when the project is running at full capacity solar energy will replace the use of 5.6 BTU of natural gas a year – enough to provide electricity for more than 200,000 Omanis, or which could be used for industrial development or exported as LNG. The pioneering technology will also help diversify Oman’s oil-based economy by establishing a new solar power industry, while creating much needed jobs and training in engineering, construction, operations and administration; over 60% of employees at GlassPoint’s Oman subsidiary, established for this project, are Omani nationals. The vast majority of the materials needed to manufacture the Miraah steam generators can be sourced locally within the Sultanate, which helps generate in-country value through local supply chain development. And as a clean energy source, Miraah will reduce carbon emissions by over 300,000 tons annually, the equivalent of taking 63,000 cars permanently off the roads. With the success of Miraah and other EOR solar projects, Oman is considered to be the Middle East regional leader in energy convergence, uniting renewable and conventional energy industries to demonstrate a significant and lasting economic benefit for the Sultanate. It is showing the way – and the industry is following. GlassPoint recently announced a project with oil and gas producer Aera Energy to build the largest solar plant in California, USA, which will be the first of its kind in the world to use solar steam and solar electricity to power oilfield operations. Can the UK return to oil self-sufficiency? Climate change has raised questions about the future of carbon-intensive industries, including the development of unconventional oil reserves. But emerging technology from Canada is proving that heavy oil extraction can be made cleaner without imposing major costs on producers or the environment. Multidisciplinary interaction and local skills development proved critical when analysing scenarios for advanced chemical EOR in a Sudanese field, thus enabling future sustainability for the vital Sudanese petroleum industry. New data from the northern terminus of the Leduc reef trend in western Canada shows a karsted carbonate reservoir with exceptionally high porosities and permeabilities and, in places, bitumen-filled caves. This area is a prime prospect for bitumen development and a new technique, thermal assisted gravity drainage, is being used to recover the hydrocarbons.